At The Spoon Trade American Eatery, the first thing you’ll notice is the cluster of antique spoons dangling in the foyer. They’re silver, gunmetal, slate, battleship—and all hues in-between. Some capture the Grover Beach light and throw it back with dazzling intensity. Others have seen better days. All are special if you ask Chef Jacob Town, who owns the restaurant alongside his wife, Brooke, and longtime friend and partner Patrick Bergseid. Friends are well aware of the chef’s strange soft spot for spoons. He knows them intimately, like family, often giving them away as cherished gifts. Some are made to slurp soup (the round-bowled bouillon spoon), while some are more diminutive and ornamental, perfect for picking up cappuccino froth or caviar. Between the teaspoon and the tablespoon sits the famous dessert spoon: everyone’s favorite. The French sauce spoon is similar to the dessert spoon, but with a flatter, notched bowl … but really, you should ask Jacob about all that, including his collection of 1940s Lady Hamiltons. He’s the expert, after all. 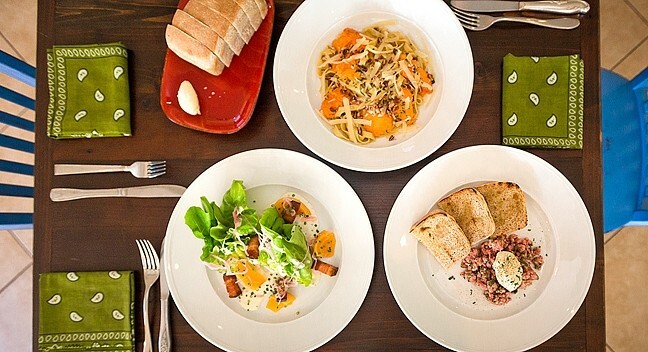 HANDLED WITH CARE: From left, locally sourced butter lettuce with house made pickled veggies and house-cured bacon; freshly made pasta with local pumpkin and butter sage sauce; and steak tartare on freshly baked sourdough bread at The Spoon Trade. When I first sat down for an interview with the friendly folks of The Spoon Trade, Chef Jacob spent the first half of the interview listening in on our conversation while kneading fresh sourdough for the coming lunch service. You see, the kitchen and dining room are physically open to one another—offering up a true sense of culinary transparency that you can see and taste. “We loved the open kitchen, which really goes with our philosophy of serving open, honest food in terms of how we cook our food, where our food comes from, and the service we provide,” Bergseid said. The pumpkin pasta—drizzled with sage brown butter and pecans—is made with house made tagliatelle pasta and local pumpkin. The aforementioned sourdough is made with native yeast and is, in itself, a unique reflection of this particular Grover Beach kitchen, located just a stone’s throw from soft, undulating dunes (it’s amazing topped with meaty steak tartare). 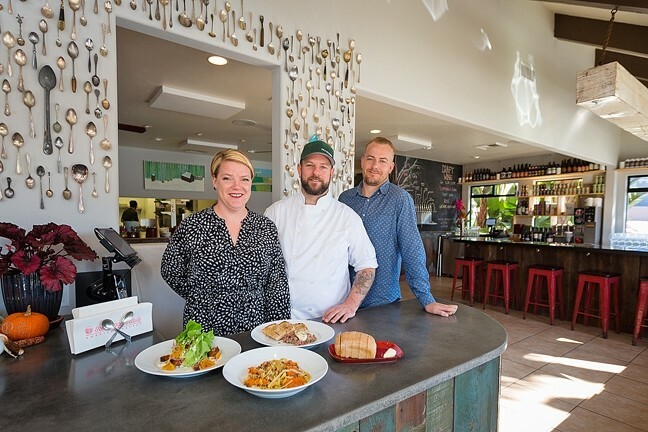 POWER TRIO: From left, The Spoon Trade Co-Owners Brooke and Jacob Town and Patrick Bergseid are bringing modern, fresh, seasonal American food to Grover Beach. Now, this may sound like a risky experiment (no, he wasn’t kidding about the 40-ouncer), but these three masterminds know what they’re doing. Really, they’re pulling from more than three decades’ worth of cumulative experience in the food, drink, and restaurant-starting biz. The result is an approachable menu featuring awesome local ingredients with a side of eclectic charm (see: the spoons, the ambiance, the drink list). Brooke, who moved to the Central Coast from Colorado in 1989, and Jacob, who moved from San Diego in 1995, met at the Cracked Crab in Pismo Beach. The year was 1999 and together with late owner and mentor Mike Lee, they helped open the restaurant, now a coastal institution. “Jacob steamed the first basket, and I dumped it,” Brooke said. A few months later, the pair met Bergseid, who was busing tables at the Crab. It was the start of a three-way friendship that would last for more than 15 years. When Brooke and Jacob relocated to the Bay Area in 2003 (she went to art school; he to culinary school thanks to the urging of his mentor), so did Bergseid. Jacob and Brook lived in the inner Sunset, while Bergseid lived in the outer neighborhood, and they remained close. UNIQUE SLURPS: At The Spoon Trade, you can sip on a long list local and imported beer ranging from Clown Shoes in Massachusetts to Oregon’s Rouge and even 40 ouncers of Miller Highlife (just don’t try to double fist it). Wines are sourced from France, Paso Robles, Monterey, and beyond, and hard cider comes in a nifty can thanks to Paso Robles’ new Tin City Cider Co.
It’s not like they didn’t talk about it. Constantly. With the support of local friends and relatives, the trio transformed that dream into reality. The Spoon Trade opened Aug. 14 and, since then, has been making waves across the culinary scene. A good reason: There’s a lot to sink your teeth into, and there’s a story behind every plate or piece of furniture. 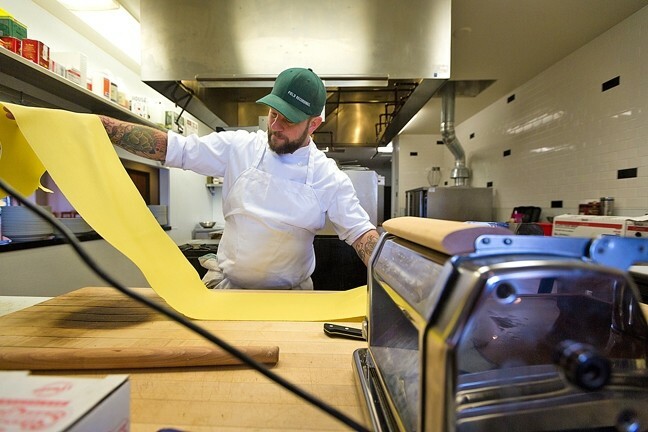 IN THE DETAILS: The Spoon Trade Co-Owner/Executive Chef Jacob Town makes fresh pasta in his bright, airy Grover Beach kitchen. Diners can see everything that goes on in the kitchen thanks to an open window that connects the dynamic space to the dining room. You can also sit outside in the heated patio area. The wood from the bar was sourced from a local barn. Friend Burl Vreeland crafted the artwork hanging on the walls. Made from found materials, each piece depicts a different season—which is apt, when you consider the incredible seasonality of the menu. Brooke said she didn’t try to force the restaurant into a mold. Instead, she thought about Grover Beach and the people who live there. Like the landscape, the menu will always ebb and flow with Mother Nature. LET’S SPOON: Head out to The Spoon Trade at 295 West Grand Ave. in Grover Beach for American food with a modern, seasonal twist. Hours are Thursday through Monday 5 to 10 p.m. For more information, go to the thespoontrade.com. Local farmers, winemakers, and ranchers aren’t just involved in supplying goods to the restaurant, they actually eat there on a regular basis. Hayley Thomas is polishing the silver at hthomas@newtimesslo.com.